Growing up, my family always had a garden. 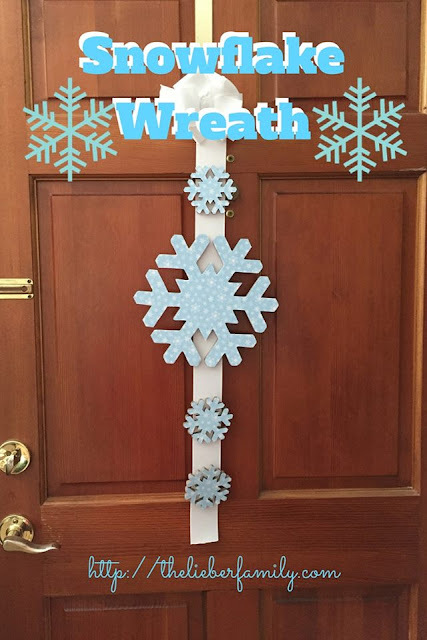 It's a tradition that we've tried to keep up with in our home, but it doesn't always work out. While we can't always get fresh fruits and veggies from our own yard, I do make the effort to purchase them at the grocery store. 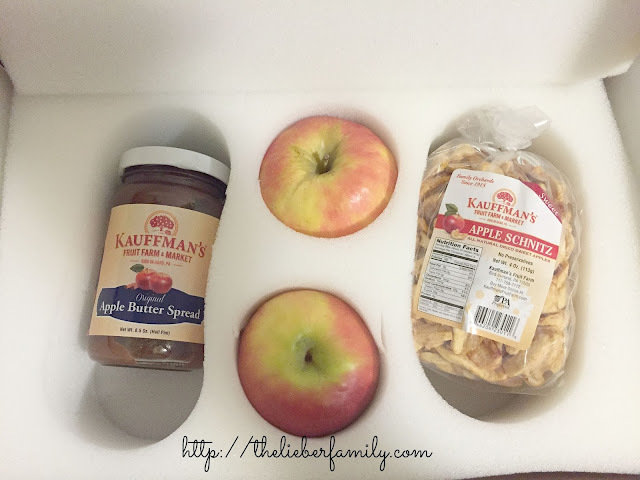 I was recently given the opportunity to partner with Kauffman's Fruit Farm to highlight their offerings. Not only was I excited, but the so were the kids when I told them. They love fruit and I love to offer it as a snack or with a meal. The gift box of orchard samples included 2 red apples, homemade apple butter, and apple schnitz. They were packaged very nicely and arrived quickly. I was just home from work when I got the package, so I was tempted to eat an apple while I made dinner, but I quickly reminded myself that you lovely readers deserved more than that, so I waited. I did let the kids try the apple schnitz. Watch out! I turned my back and those things were gone! I ate enough to know they were delicious, and evidence from the kids seems to support that as well. They are chewy, sweet, dried apples that can be used for lots of yummy desserts...unless you leave an open bag near my kids! As the kids were getting ready for bed, I had an idea of something I'd seen online at one point and I realized that I had the ingredients for it already in the house. As soon as I shut the bedroom door, I ran to the kitchen and called Ken to come help me. You work with what you've got, right? Cut the tops of the apples off and scoop out the seeds with a melon baller. While you are cutting the apples, have your husband mix the butter, brown sugar, flour and cinnamon together and microwave them for about 30 seconds. Mix well. 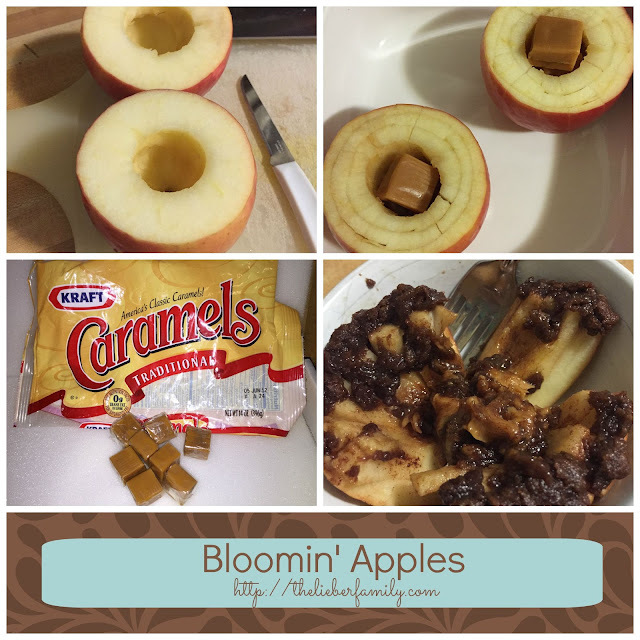 Add two caramels to the center of each apple and then pour the sugar mixture over top of them. Bake the apples for about 25-30 minutes at 375. Baking time will depend on how firm your apples are to begin with, so check them frequently after about 20 minutes. After you take them out of the over, scoop each one into a bowl. You can top them with ice cream if you choose, but we didn't. Make sure to enjoy them quietly or you might have to share!